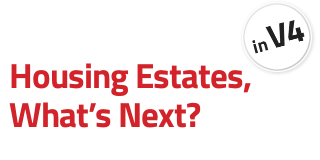 International Conference 2014 | Housing estates, what next? International conference "Housing Estates, What's Next?" 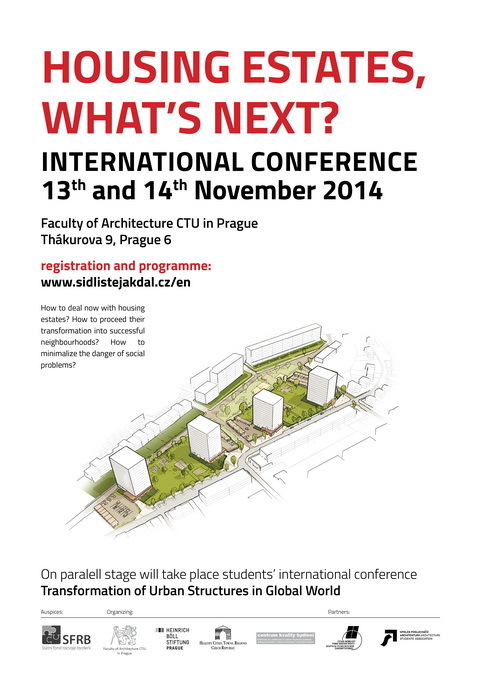 took place on 13th and 14th November at the Faculty of Architecture CTU in Prague, Thákurova 9, Prague 6. Two-day conference in Prague aimed to describe the possibilities of housing estates transition not only from architectural viewpoint, but also with focus on related policy-making processes, role of administration, and private sector involvement. First day of the conference was based on a complex introduction of three housing estates urban renewal examples. Panel discussion with invited guests followed. During the second day of the conference, results of case studies and research project were shown, and Czech experts including architects, urban designers, sociologists and municipality representatives introduced local experiences. Programme of the first day is based on a complex introduction of three housing estates transformation examples which were chosen as ones of the most significant and widely presented round Europe. Each of them differs in background context, actors involved, and mainly in scale of intervention which was based on region development potentials. Modernist Bijlmermeer in Amsterdam represents one of the most known examples of high-rise area transformations in Europe. The city of future turned into problematic locality soon after its completion. Redevelopment finally reached 55% of demolitions, flats had been replaced by single-family dwellings mostly. The whole area was differed into smaller localities with individual character and local centres were strengthened. The renovation of the Bijlmermeer is a joint project carried out by the Municipality of Amsterdam, the City District of Amsterdam-Zuidoost, and Rochdale Housing Organisation. Lyon’s suburb Vaulx-en-Velin is currently undergoing an urban regeneration in Grand projet de Ville. Project focuses on social disparities solution and consists both of spatial and social interventions. Grand projet de Ville is co-commissioned by the state, Grand Lyon and Vaulx-en-Velin city. It is also involved in territorial projects defined by CUCS (Contracts of urban social cohesion) and ANRU (National agency for urban regeneration) which takes major part in the project financing. From structural perspective project involves street system redefinition, setting-up a new hierarchy of spaces, and new dwellings and infrastructure construction. Since post-socialist transition, Leipzig has been continuously shrinking. Decision to adapt and manage the shrinkage evolved in Grűnau housing estate transformation project. The planning strategy consists of preserving the architectural heritage, demolitions of buildings replaced by open green spaces, and creation of micro-scale centres. The term “perforated city” stands for a model of urban shrinkage management. Grünau with its nowadays 40,000 residents is still the biggest housing estate in Leipzig, even after the loss of almost 50,000 residents since the reunification. Several strategies have been developed and programs been used to deal with the shrinkage, spatial deficits, and increasing social problems. The municipality in cooperation with housing companies and civil stakeholders of Grünau is currently preparing a new strategy for Grünau since the loss of population is stopped and growth is predicted. After years in which vacancies, demolitions and brownlands have been the main issue for urban planning, an integrated view on the future development of Grünau is possible. Second day of the conference will focus on specific topics divided into thematic blocks. Each topic will be presented by professionals from Czech and Slovak republic. In the first block leaders of the project will introduce the project itself, received knowledge, and analysis results. Consequently, two selected case studies of Czech housing estates transformations will be presented. Proper knowledge of historical values and social potential of postwar housing estates is in basic importance related to efficient and complex treatment of such areas. Professionals from the field of social and cultural-historical sciences will present and discuss specific problems and values of this housing type. Block will be dedicated to possibilities of complex area management on several levels. Speakers will discuss mechanisms of residents participation, possible stakeholders involvement, and conceivable institutional support on municipality and national level. The last sequence will introduce experiences in housing estates urban renewal in the Czech and Slovak republic. The aim of this presentation is to describe available tools and also obstacles related to these processes. Speakers will also emphasise the original vision on which the project was based and will evaluate the project overall.